The front entrance appears simple and unassuming, however, it is an iconic part of history, nestled on Third Street, in the town of McMinnville, Oregon. Nick’s has been a vital part of the Yamhill County wine scene for the past 30+ years. It is the norm to find local winemakers gathering to enjoy Nick’s amazing Italian food while sharing stories and winemaking advice. The inside is warm and inviting and we had an amazing dinner there last night. The meal was five courses and everything was absolutely fantastic. A couple in the booth directly behind us who were swapping spit with such intensity our booth was shaking. They eventually (after eating) took it outside and continued in front of the big glass restaurant windows. It was…uh…interesting. We can’t wait to go back, the food was truly excellent. How wonderful it is to find a restaurant that’s new (to you) and so very delightful… well, maybe the face-sucking company aside. That sounds like an amazing dinner. I am laughing about the make-out couple. I would hhave been cracking up. What are people thinking? The halibut and grilled squid dishes really stand out. Along with the dessert. Kissing couples…not so much. This is so going on my bucket list of places to eat! Yum! Your items sound like just what I would have ordered! Mmm! LOVE LOVE LOVE Nicks. We have reservations for next Wednesday Night. It was my favorite restaurant on last year’s Oregon trip. Thanks for the post. Wow…was that a la carte or for the five courses? I am glad you are enjoying your new surroundings. It sounds wonderful! Everytime we are in McMinnville we eat at Nicks. We love that place. LOL about the couple…people can be such fools. 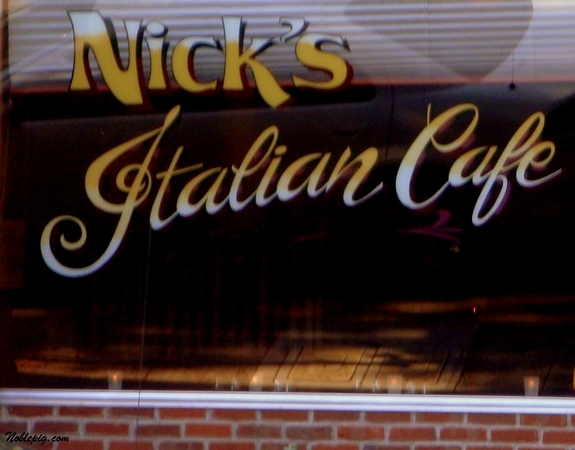 i went to Nick’s years ago and loved it. It sounds like the perfect dinner… complete with stage show! EWWWW not in the restaurant and not till your booth is shaking gimme a break. How do you even know what to order on a menu like that? Of course you do know your foods, I would be so overwhelmed with that many choices that I might have said spaghetti. The food you ordered sound really delicious. Halibut and pancetta vinaigrette sounds very intriguing. Your meals sound amazing. Great to have a place like Nick’s nearby. Ugh on the entertainment. Take me with you next time ;)! Sounds like a place I would like to eat at. I love local places like that! Both your meals sound great and the Halibut dish sounds amazing. Any chance of them sharing the recipe with you? Wow! Dinner AND a show! The food sounds great and the show . . . it sure does sound interesting! ….and the entertainment too! JK….It all sounds so de-lish! Except the squid…..go to my blog and look at my second post…..tooooooooooooooo funny!!!! But seriously when I die….I want to come back as YOU!!!!! Both of your dinners sound so tasty! And that couple reminds me of this “family restaurant” we used to frequent when I was little. We hadn’t gone in a few years and when we went back we realized it had become home to couples just like that! Here we were, a family of seven, sitting in the middle of 6 booths with couples doing that same thing (and more, yuck!) in the restaurant. We never went back. I love this restaurant! Lunch is really very delicious as well (get the pizza get the pizza), and I’ve been scheming, trying to come up with a reason to head down to McMinnville again! Glad you enjoyed. …and you thought life in Oregon would be boring. We have it all! Your meal sounds terrific. Nick’s is a terrific Italian restaurant. For a small town McMinnville has several very good ones. Sounds like you are settling in. It sounds like you’re settling into life in McMinnville nicely. We love Nicks. So glad you’ve made it to McMinnville…you’ll love it here. I’m just wondering if that is what Nick’s menu does to a person. We could all use a little passion in our life. But they could have atleast waited till they got to the car. Or home, would be better. Sounds fabulous! Reminds me to make a reservation…. I know where I am going to eat the next time my husband and I have a date…it sounds like it will be worth the drive. We love McMinnville and the surrounding area, and look forward to visiting again. We will have to try that restaurant out, hopefully without the entertainment! Those look just like Horseback potatoes, and they are awesome! Hope you don’t mind but I’d love to direct Foodista readers to your blog. Just add your choice of widget and you’re all set!